Categories: Hanumad Jayanthi, Hanumad Jayanthi, Hanuman, Krishna, Rama. 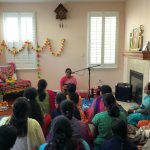 By Sri Swamiji’s grace, the Irvine GOD Chapter was immensely blessed with Sri Poornimaji and Sri Gayathriji’s satsangs in Irvine for three days from December 15-17 2017. 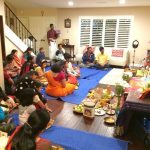 The satsang started off with Gayathri Ji on Friday evening,December 15th 2017 at the residence of Sri.Shankarji and Smt.Sujanji’s residence expounding on the importance of Satsang and the story of Naradji becoming Narad through Satsang. She also highlighted the significance of chanting Nama through the introduction of Bagavatham. 40 members attended the first day satsang. On the second day Saturday December 16th 2017, Gayathri Ji. revisited the power of Nama and explained how Satsang is a blessing that only a handful of people are provided the opportunity to attend. Gayathri Ji. elaborated on how God assists people through granting their materialistic wishes; however, he reserves the divine Satsang for just a select few. 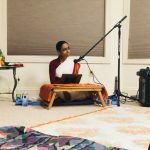 She concluded with the Dhruvacharitra, describing how with the persistent belief of God and the guidance of Guru, one can connect with God regardless of age. 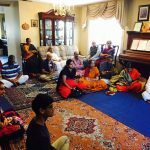 The satsang took place at the residence of Sri.Ganesanji and Smt.Lathaji. 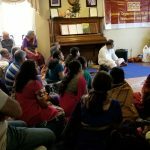 About 50 members attended the satsang. 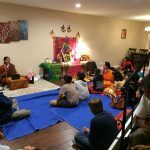 On the evening of the second day at Chino Hills, Poornima Ji. 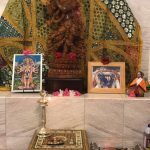 reintroduced Nama Prabhavam and the significance of Satsang. 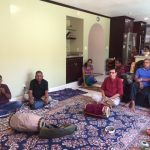 The satsang took place at the residence of Smt.Padma Kalyan. 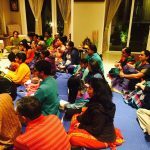 Close to 30 members attended the satsang. 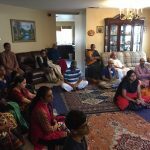 On the morning of the final day , Sunday December 17th 2017 at Lake Forest at the residence of Sri.Srinivasanji and Smt.Preethiji, Poornima Ji. coincidentally described the Hanumath Prabhava on the day of Hanumath Jayanti. 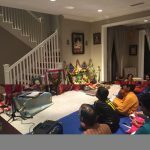 She also expounded on the Hanuman Chalisa and Hanuman’s ability to perform any task at hand utilizing the sublime power of Rama Nama. 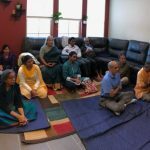 Close to 30 members attended the satsang. 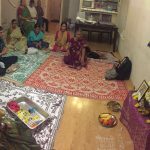 The evening Pravachanam was led by Gayathri Ji., who concluded the Satsang with Rukmini Kalyanam. 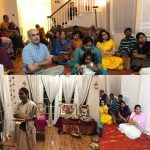 Overall, the Satsang experience was enlightening and introduced a diverse audience to the importance of Rama Nama with the grace of Sri Swamiji. This unquantifiable power is capable of satisfying materialistic desires as well as illuminating the path to attain God.